Army wife Judy Davis has become acquainted with various states in her mobile lifestyle, states like Colorado, Texas, and Missouri. The one she’s been in lately is particularly familiar: a state of flux. Turns out it’s the perfect state from which to launch her first book, Right Side Up: Find Your Way When Military Life Turns You Upside Down. Moves for military families usually occur at predictable intervals, but Judy’s husband received unexpected orders for a move coinciding with the September 2014 publication of Right Side Up. 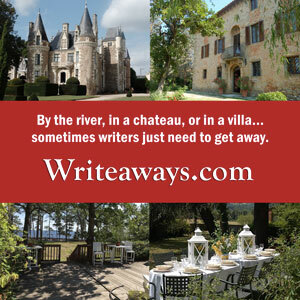 Such an upheaval might be a roadblock for some authors, but Judy turned the obstacle into a stepping stone. 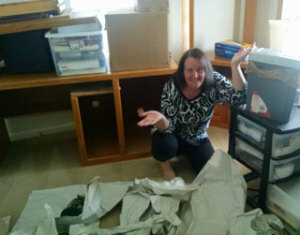 For her, the chaos of relocation has become an opportunity to live out the principles she’s written, and to talk about them too, as she meshed book events with pack-out dates. Judy Davis packs up her office during a military move that unexpectedly came at the same time as her book release. In her book, Judy brings these strategies to life with personal stories, directed journaling exercises, and stress-relief practices. The principles she advocates–finding a firm footing, calming chaos, flushing stress, responding to change–are the same principles she uses to find her way forward in a dynamic military life. Judy recalls that becoming an army wife caught her off guard from the outset. She and her husband, Geoff, had been married seventeen years and had two teenagers when Geoff came home one day and told her he wanted to return to the army career he had left before their marriage. At the time, Judy was running a home-based marketing business, which also provided training for small businesses. “I never intended to be an author,” says Judy. But military life has given her stories she now feels compelled to share. Like the day she found herself in a hospital bed soon after her husband returned from his first deployment. That close brush with a heart attack convinced Judy she needed new tools to handle the stress of military life. 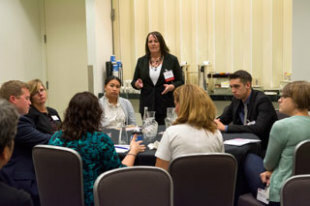 “I don’t think we are naturally equipped to deal with the challenges we face as military families, as military spouses. It’s a skill set we need to learn,” Judy says. After Judy’s cardiac wakeup call, she began to change the way she navigated military life, and adapted her skills to meet the challenges. There would be more challenges to come. When her son, also named Geoff, was in college, he experienced a crisis that led him to contemplate suicide. Fortunately, he reached out to his parents, was diagnosed with post-traumatic stress disorder, and received appropriate treatment. Judy learned he had been internalizing his struggles as a military child. “Our son was under so much stress thinking that it was his job to take care of me while my husband was gone, or if something happened to his father,” says Judy. “We never told him it was his responsibility to take care of me.” But he put that pressure on himself anyway, a pressure felt by many military kids. Since that time, Geoff has fought his way back to health and has joined with his mom to tell their story of healing to help other military families. With his mom, he created LivingThruCrisis.com, an information site for similarly-challenged families. Mother and son have also begun appearing and speaking together publicly on the subject. Through all these experiences, Judy kept journals, detailing her personal and family challenges and the tools she engaged to navigate them. As she developed coping exercises, the material for Right Side Up began to take shape. Her children encouraged her to submit the manuscript, to share her story, and she did. Judy also told her son’s story in an essay for Stories Around the Table: Laughter, Wisdom, and Strength in Military Life, released in October 2014, just a month after Right Side Up. Though she had not dreamed of becoming an author, she says having her work and her stories published helps one of her dreams come true: a dream to use her experience to help others. Through her books, she’s doing just that. 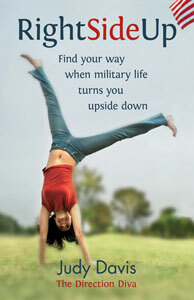 Buy Right Side Up at MilitaryFamilyBooks.com or Amazon. 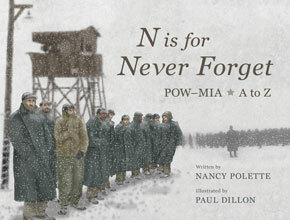 Buy Stories Around the Table at MilitaryFamilyBooks.com or Amazon. Terri Barnes is a military wife and mother, and the author of Spouse Calls: Messages From a Military Life. She is the military family columnist for Stars and Stripes and special projects editor for Elva Resa Publishing. Feb 2015 UPDATE: Judy has released her third book as an ebook, coauthored with her son: Warning Signs: A Parents Guide, Is Your Teen At Risk for Suicide Ideation, Depression & Addiction?